With high resistance to imbalance from weight or tipping, these standard height storage solutions allow for ease of item retrieval without strain. 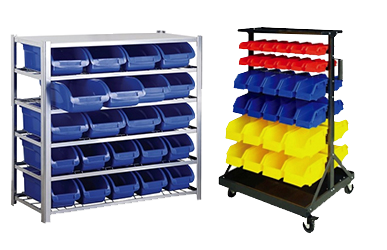 Some configurations of bin rack systems come with castor wheels that move the rack along the floor space. Wheels facilitate easy movement of bin rack from one operation station to another without going through the cumbersome process of moving each item at a time. The bin racks come with hand-operated handles that facilitate access to one storage unit at a time.